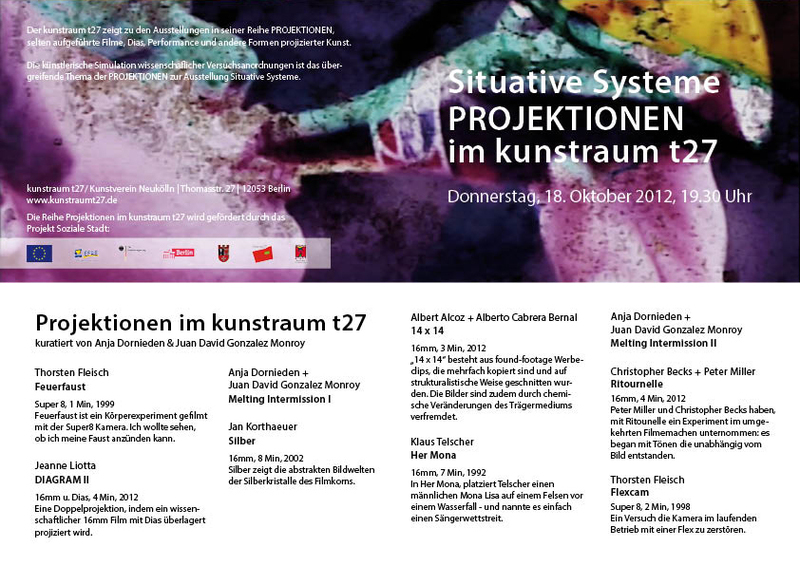 perspective matters – two staged concerts (trailer) from DISTRUKTUR on Vimeo. 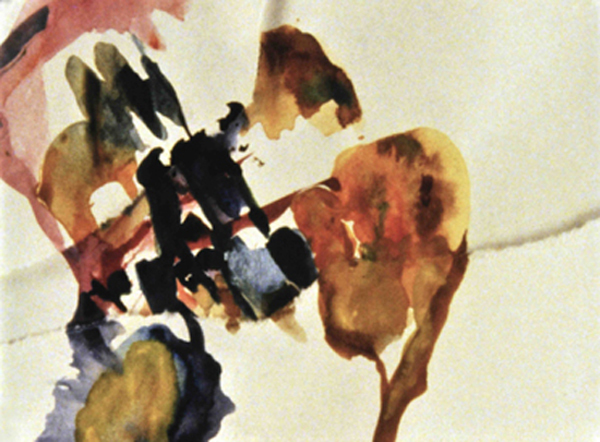 On the occasion of its 15th anniversary, ensemble mosaik is developing a two-day concert project with the Brazilian 16mm film duo Distruktur and the director Thomas Fiedler. Titled perspective matters, works by six contemporary composers will be performed in an extensive installation. Thoughts on the psychology of perception are at the root of this project; a musician, film artist and director investigate and shape listening perspectives with artistic means. They will test the influence on listening habits; the possibilities inherent in different listening perspectives and situations in space will be sounded out and consciously applied. The same way an audio guide leads visitors’ gazes through collections and to individual art objects in visual arts exhibitions, this two-day project will guide the public’s listening and focus on perspectives and possibilities. The auditory influence isn’t part of an educational objective; instead, the process of perception is the subject of artistic analysis. The audience experiences the variety of possible hearing experiences. Perspectives are simultaneously the issue and the central element for shaping both evenings. 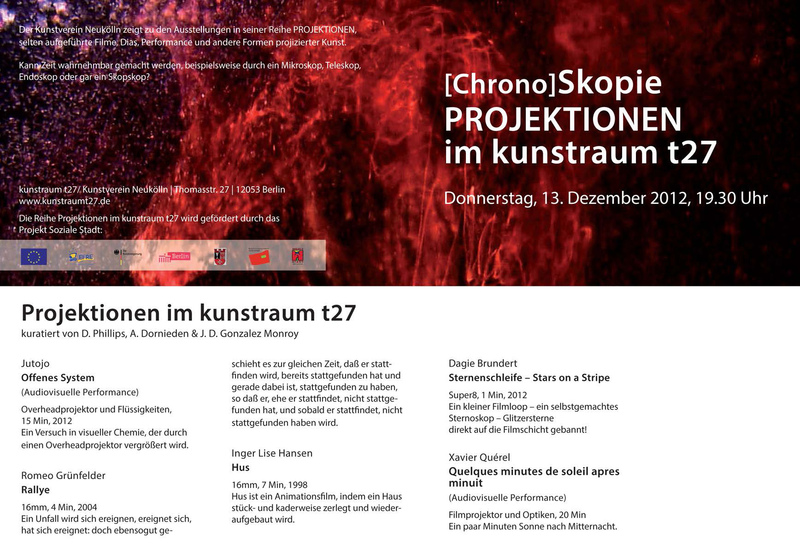 This Thursday Dec. 13th @ 7:30 pm, Anja Dornieden, Juan David Gonzalez Monroy and Deborah Phillips will be presenting an evening of films and performances at kunstraum t27 to accompany the exhibition [Chrono]Skopie curated by Deborah Phillips. The program includes live performances by Jutojo and Xavier Quérel and films by Inger Lise Hansen, Romeo Grünfelder and Dagie Brundert. Guillaume Cailleau bridges conceptual working methods with playful references to the avant-garde. This playful mix of forms, expanded cinema, experiments with human perception, and poetic compositions makes the viewing experience very enjoyable for its richness. His sincerity, combined with a joyful wink of the artist’s eye add to this impression. 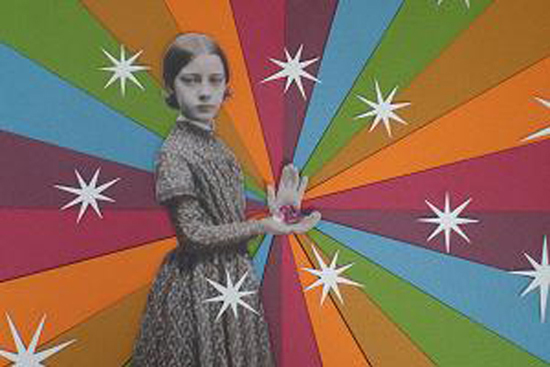 Explorations – or games – with color separation, the basics of color photography, are as much part his artistic arsenal as the lyric beauty of rich black and white contrast of high-con film combined associatively on an optical printer. The artist will perform live, and will be available for Q&A. Anja Dornieden and Juan David Gonzalez Monroy will be presenting a screening on October 18 at 7:30pm of works on 16mm and super 8 film at kunstraum t27 to accompany the exhibition Situative Systeme that runs from September 22 until October 21. Filmmmakers Thorsten Fleisch and Christopher Becks will be there in person to present their films. Join us! 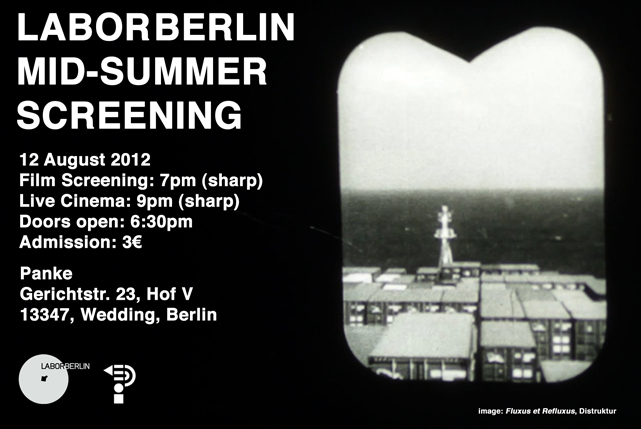 This Sunday at 8pm, Arsenal Institut für Film und Videokunst will host the first of two warm-up events leading up to Think:Film, the International Experimental Cinema Congress 2012. 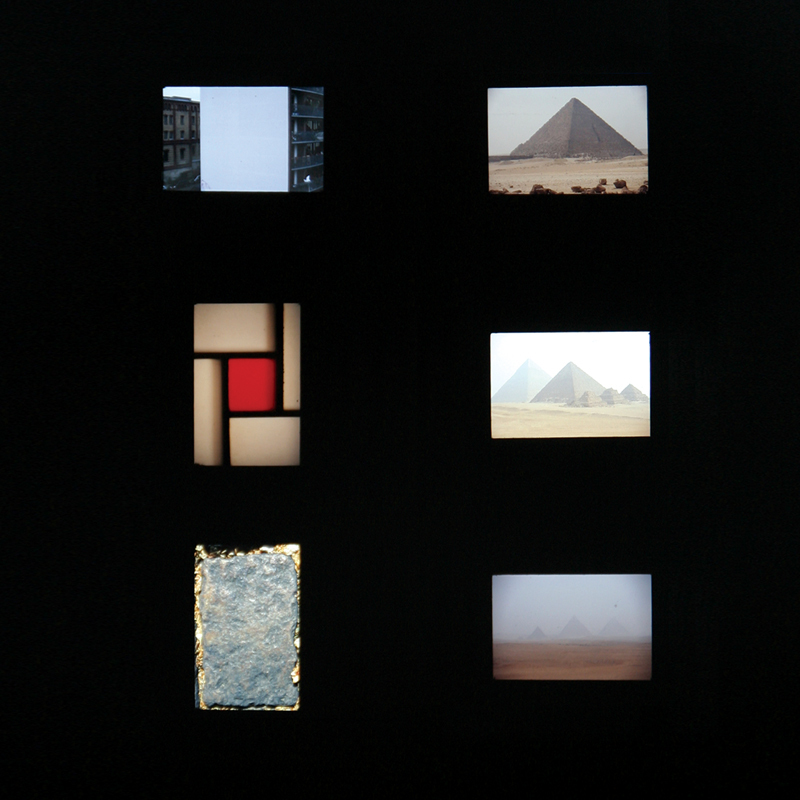 They will present SUMMER 70, an Italian-Egyptian experimental film by Paolo Isaja and Nagy Shaker, made in Italy in 1970. 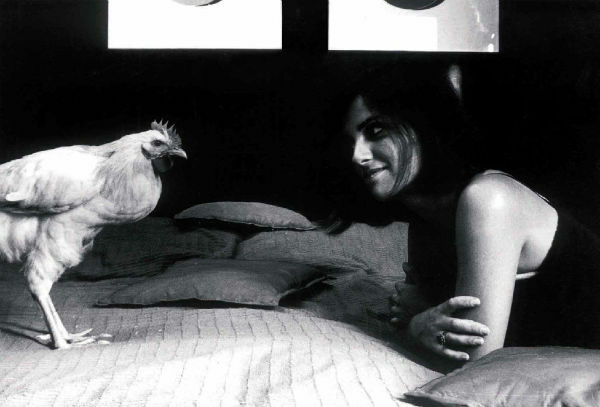 The 63 minute film, “a meditation on freedom at the turn of the 1970s, which utilizes the full vocabulary of experimental cinema to evoke youthful experimentation and energetic abandon” (MoMA) will be screened in a newly restored 16mm print. The Egyptian director Nagy Shaker will be present for a discussion. Beforehand, LaborBerlin will present results from Analogue Zone, a workshop on analogue filmmaking which was held in Cairo in May of this year. Four of the participants of this workshop are in Berlin at the moment for a second workshop held at our lab in Wedding. 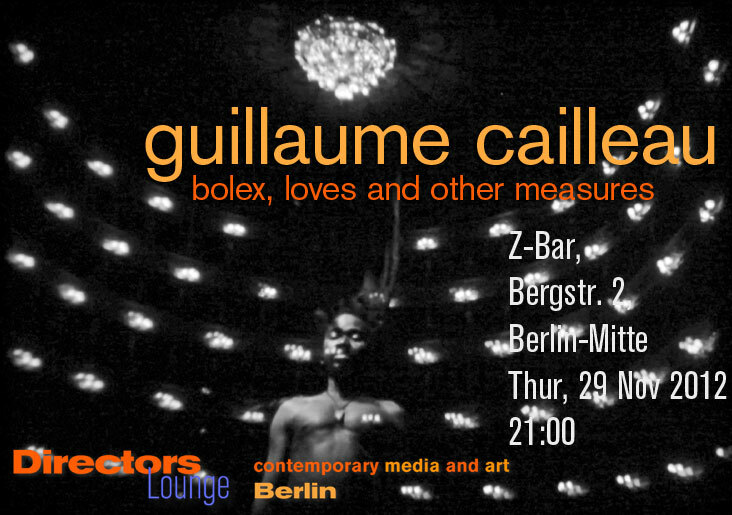 LaborBerlin members Gustavo Jahn & Melissa Dullius will be showing works in 4 events in Berlin this month. 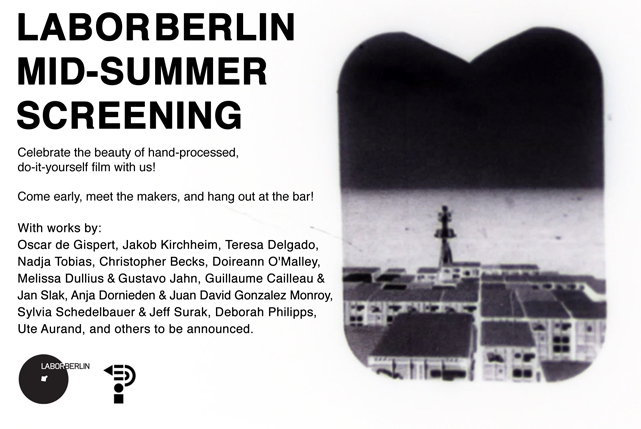 On Sunday, the 12th of August, LaborBerlin presents a Mid-Summer Screening at Panke in Wedding, featuring works by members and friends. 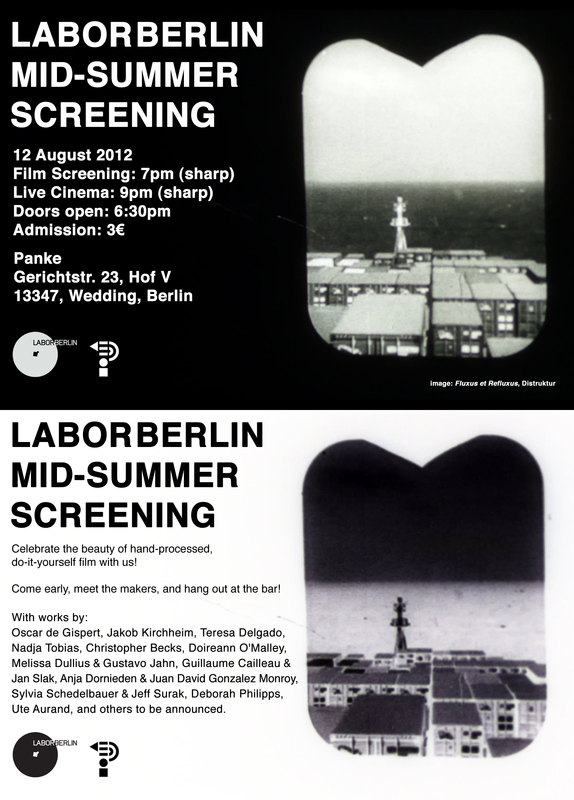 The evening is organized in two parts: the first one starts at 7pm (sharp) and shows new films made at Labor. 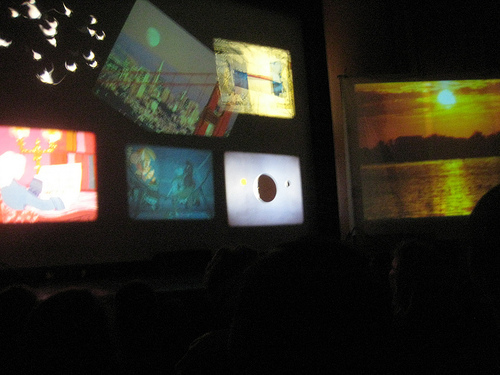 Starting at 9pm (sharp), the second part consists of live cinema collaborations. Celebrate the beauty of hand-processed do-it-yourself film with us! Doors open at 6:30. Please feel free to come early, meet the makers, and hang out at the bar! With works by Oscar de Gispert, Jakob Kirchheim, Teresa Delgado, Nadja Tobias, Christopher Becks, Doireann O’Malley, Lia Leticia & Karen Black, Melissa Dullius & Gustavo Jahn, Guillaume Cailleau & Jan Slak, Anja Dornieden & Juan David Gonzalez Monroy, Sylvia Schedelbauer & Jeff Surak, Deborah Philipps, Ute Aurand and others.